Where’d I put the Neuralyzer? Last night, a Philadelphia Flyer scored the first goal ever in the Consol Energy Center. That is so gross. I’d rather see a dead octopus on the ice. I’m not even going to talk about the loss. I can’t. It was too little too late and we lost and the Flyers won the first game in Consol and the Flyers scored the first two goals in the Consol … ugh. Anyone but the Flyers. 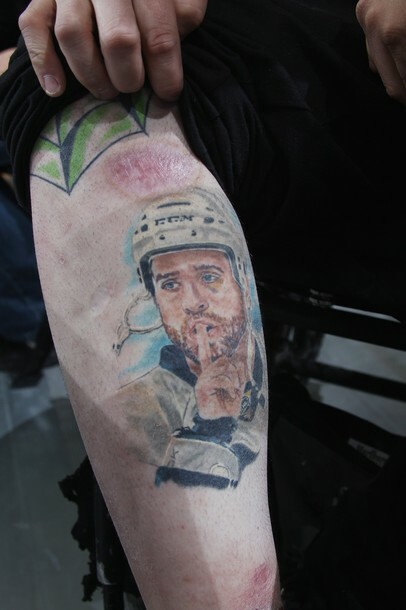 Mario pouring water from Mellon Arena’s ice onto the new ice, and an epic Max Talbot tattoo. Let’s just pretend the rest of the night didn’t happen. P.S. I am greatly disturbed that I can’t place the body part that tattoo is inked on. Is that a leg? An arm? Are those shackle bruises on the bottom and top? To put your mind at rest, someone is reaching down to pull up the leg of their pants to reveal the back of their left calf muscle. Most likely he’s a recreational hockey player and the bruises are from shin guard straps. I used to forsake “union suits” and get marks like that, too, back in the day. Ducky taught me all about identifying things like this on NCIS. Sorry, that’s the right calf. Didn’t say Ducky taught me well. My guess would possibly be burns from the exhaust pipe of a motorcycle. I have a scar on my leg that looks a little like that too. I think it is the back of an arm with a touch of ringworm. Actually this my leg! The scars are from exhaust from my atv burning my leg. The tat is located on my inner calf. I have also just added a Mario and Badger Bob tat on my thigh. My goal is to finish off my right leg covered with Pens players and logos. I’m with you on the Flyers bummage. I’m pissed that our house has been sullied by their mere presence, let alone this modicum of success. Love those pictures. The shot of Mario is Desktop material. And Kudos to Jeff and the Shush Heard Round the World. Thanks a lot for the awesome Mario pic. I spent the most of last night (remember I am in Europe aka 6 hrs ahead) listening to the game on Pens online radio. Listening how they lost the game was awful and I felt bad the whole day – being totally TIRED at work didn’t help (the game ended short before 4 am my time, alarm rang at 7.30 am). Dear Pens, please don’t keep loosing. Don’t wanna waste my career with being too tired at work for nothin’ ;) THANKS! The Mario pic looks like it was a really dramatic and reverent moment. Now, LET’S GO PENS!! Giant heaping BOOOOOOOOOOOs to Versus’ NHL coverage, who chose to show some lameass Canadian band playing outside in Toronto instead of the opening ceremony of the NHL’s newest arena. And the bubbleheaded blonde “reporter” who called the Consol a “barn” one too many times for my sanity…..
Now 0-2 at Consol. Was that water in Mario’s bottle actually from a restroom at PNC? ROTFLOL @Pa-pop although 0:2 is not funny at all. How many games in a season? Everybody CTFD. If they’re still winless in January then you can worry. I was there, it was life-changingly awesome, and two 3-2 losses should have the statistically minded at the Trib projecting that they’ll be 0-40 in the new arena (remember one home game will be played at Heinz Field). I mean, that’s how the Trib determines whether crowd sizes are up or down for parades, right? Small sample size? Just got home from a long few days of watching disappointing losses at the new arena. It seemed a bit much, however, to come home and attend my first NFL game only to see my beloved Broncos blown out by the hated Ravens. 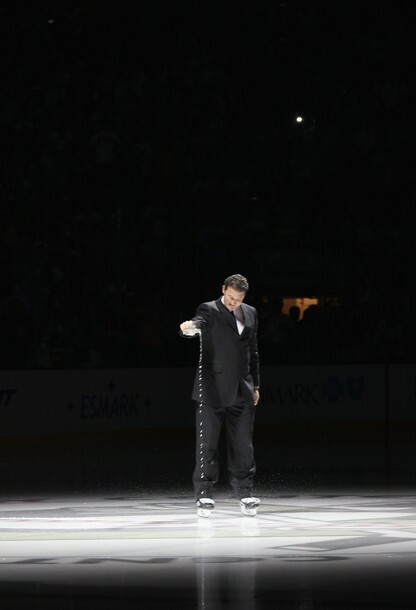 Anyway, point is, I posted some photos from opening night at CONSOL. Feel free to check ’em out – http://www.pensburgh.com/2010/10/9/1740560/game-photos-10-07-2010-pens-vs-flyers. Mario looks like a gang member pouring a 40 after a gang member’s death.